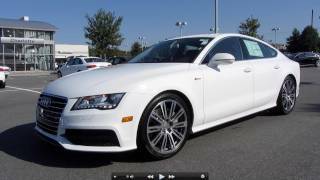 The Audi A7 2012 is the next evolution of Audi design, with short overhangs, a long wheelbase, an expansive hood and low-slung, sporty proportions. With its low roofline and integrated rear doors, the Audi A7 has a coupe-like silhouette. Other design elements that signify coupe styling are the frameless door windows and side mirrors mounted on the doors. A maximum of 310 hp and 325 lb-ft of torque allows the Audi A7 to sprint from 0-60 mph in 5.4 seconds and on to a limited top speed of 130 mph. emotional appeal of a coupe with the prestige of a sedan and the functionality of a wagon. The innovative, five-door design of the newest Audi entry sits atop a sporty, lightweight chassis and is partnered with a highly efficient supercharged V6, latest generation quattro® all-wheel drive and the latest advanced driver assistance and multimedia systems to define a new benchmark for the premium segment. The Audi A7 is the next evolution of Audi design, with short overhangs, a long wheelbase, an expansive hood and low-slung, sporty proportions. 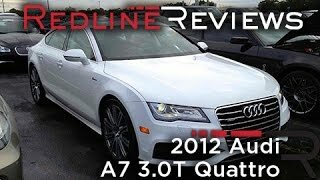 The Audi A7 stretches 195.6 inches in length and has a 114.7 inch wheelbase. Combined with its 84.2 inch width and 55.9 inch height, the Audi A7 exudes elegance and confidence. With its low roofline and integrated rear doors, the Audi A7 has a coupe-like silhouette. Other design elements that signify coupe styling are the frameless door windows and side mirrors mounted on the doors. The C-pillar stretches to the rear and flows into the shoulder, while the sharp tornado line begins at the headlights, extends across the fenders, over the doors and terminates in a gentle slope toward the tail lights, paying homage to the 1969 Audi 100 Coupé S.
chrome surround framing high-gloss black lattices with chrome accents. The horizontal posture of the fascia emphasizes the width of the Audi A7, as do the wide, low air inlets and horizontal struts. The Audi A7 comes standard with Audi’s xenon plus technology, complete with new all-weather lighting integrated into the headlamp housings. The system replaces traditional fog lamps, whose would-be location in the air intakes now is occupied by two radar sensors for optional adaptive cruise control. The signature LED daytime running lights are standard. with low energy consumption and an extended service life. In addition to the 18 LEDs used for the daytime running lamps and 11 LEDs employed for the turn signals, two powerful LED units comprise the low- and high-beam headlamps on each side. Tail lamps are fitted with LED lamps as well. The optional adaptive lighting system modifies the amount of illumination based on the driving environment, whether cornering, traveling in the city or on the highway. The integrated spoiler automatically extends at 80 mph and then retracts at 50 mph. It can also be deployed and retracted manually via the push of a button. The two large, round tailpipes of the dual-branch exhaust system are incorporated seamlessly into the bumper and benefit from an attractive chrome application. For those seeking an even more dynamic look, the Prestige package includes redesigned front and rear bumpers with air inlet grilles, extended side sills and a platinum gray diffuser insert. incorporates a horizontal line encircling the driver and front passenger that starts above the instrument panel and ends in the passenger-side door. The center console is oriented toward the driver to further enhance the driver focus of the interior. ventilation and three-stage heating, the latter of which is available for the rear seats as well. Rear seat passengers enjoy two comfortable, contoured seats with ample head, arm, and legroom. Chrome bezels frame the air vents, while aluminum-look trim accents the optional layered wood veneers and bezels. Two optional interior lighting packages are available: one composed of active door reflectors, lighted handles, and LED reading lights (Premium and Premium Plus) and another ambient lighting package (Prestige) that utilizes LED lamps to highlight door pockets, sills, and center console – all of which can be configured to suit the owner’s taste. The Audi A7 is available with two types of leather – Milano or Valcona – which color-coordinate with the four-spoke steering wheel and transmission selector lever. Fine grain ash wood veneers are standard while dark brown walnut and brushed aluminum trims are optional. The seat coverings are available in black, titanium gray, nougat brown and velvet beige, while the headlining is available in black, lunar silver and silk beige. The rear hatch is equipped with a height adjustable power-lift system that opens with the touch of a button, revealing a large luggage compartment capable of holding 24.5 cu ft. in its base configuration. Fold the 60:40 split rear seats forward and the A7 reveals an expansive cargo area with a flat floor that provides excellent functionality surrounded by stunning design. Audi continues to pioneer the use of aluminum, high-end steel and lightweight materials on the A7. 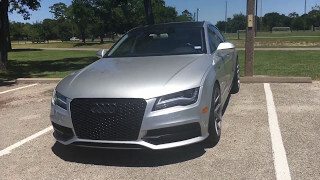 Boasting a hybrid aluminum construction that melds the lightweight metal with high-end steels of various strengths, the Audi A7 weighs roughly 15 percent less than a comparable allsteel body. 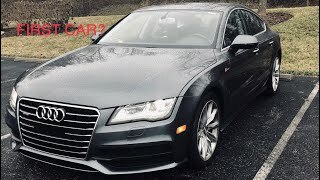 Along with a variety of engine compartment and chassis components, the front fenders, hood, rear hatch and doors are made of aluminum, meaning that more than 20 percent of the Audi A7 body is made of the weight-saving material. But light weight doesn’t come at the expense of rigidity, comfort, or safety. As a result, the body provides a firm platform for precise handling, low vibration and excellent crash protection. Vibration levels at the contact points between the passengers and the body – the floor panel, seats and steering wheel – were painstakingly minimized. The interior is largely decoupled from the road and engine noises, thanks to hydraulic damping elements on the axles, subframes and bearings. All these elements were tuned using the Audi comfort test bench, a development tool found nowhere else in the world. film on the windshield and complex sealing on the doors and frameless windows to provide a serene environment for occupants. The A7 reaffirms Audi’s commitment to safety for both passengers and pedestrians. In a frontal collision, the front cross member directs forces to the two longitudinal members, which undergo a controlled deformation to dissipate energy. A strong floor and tunnel structure for the occupant shell absorbs the impact forces. Meanwhile, the passenger cell – made up of hot-shaped steel components – provides exceptional protection. The adaptive restraint system is networked with the Audi pre sense safety system, intelligently managing the airbags and belt force limiters based on the height of the driver and front-seat passenger. Standard side airbags in the front seats, optional airbags in the outside rear seats, and curtain airbags keep occupants safe in the event of a side impact, while the integrated Audi head restraint system reduces the risk of whiplash in rear-end collisions. Audi offers a range of driver assistance systems, including adaptive cruise control and Audi side assist. The night vision assistant identifies pedestrians in the vehicle path and highlights the pedestrian silhouettes in the display to alert the driver. The Audi A7 has a brake system designed for maximum performance. The front discs measure 14.02 inches (356 millimeters) in diameter and 13.0 inches (330 millimeters) at the rear. dashboard when the ignition is switched on. It consolidates audio, navigation and telephone functions into one simple interface, featuring MMI touch that enables the driver to enter navigation or telephone information with the stroke of a finger using handwriting recognition technology. This intuitive system reduces driver distraction and has been rigorously tested for usability and reliability. brings a whole new level of real-time driver-relevant information into the vehicle such as Google Earth™ navigation with voice recognition (first-to-market), Google™ Local search and Wi-Fi® connectivity (first-to-market as factory-installed option with integrated mobile broadband connectivity) for up to eight devices enabling passengers to surf the internet, download videos or check email. For additional information regarding Audi connect, please refer to the following link on the audiusanews.com website: http://www.audiusanews.com/pressrelease/2286//what-audiconnect. A five-inch display fits between the tachometer and speedometer to relay everything from music controls to navigation instructions to the driver, while an optional heads-up display projects the most important information onto the windshield. A range of high-end audio options are available, including a 14-speaker BOSE® sound system or the range-topping Bang & Olufsen® Advanced Sound System, complete with 15 speakers and 1,300 watts of power. The Audi philosophy of intelligent downsizing is embodied in the A7 with the fitment of its 3.0 TFSI® V6. Located in the 90-degree V of the cylinder banks is a belt-driven supercharger that compresses intake air to a maximum of 0.8 bar, resulting in seamless power delivery befitting a true sports sedan. A maximum of 310 hp and 325 lb-ft of torque allows the Audi A7 to sprint from 0-60 mph in 5.4 seconds and on to a limited top speed of 130 mph. individual. Audi drive select is standard on the A7. The Audi A7 features the latest generation quattro permanent all-wheel drive system, featuring enhanced torque vectoring. Depending on grip, speed and axial forces, the system will alter the standard 40:60 front-to-rear torque split. quattro all-wheel-drive works together with an intelligent brake management system to quell under steer by lightly applying the brakes to the inside rear wheel, thereby contributing to seamless, neutral cornering. The front suspension of the Audi A7 is a five-link arrangement with hollow stabilizer bars, along with a die cast strut brace to increase frontal rigidity. The rear axle follows the track-controlled trapezoidal link principle, with two hollow trapezoidal links and two longitudinal and lateral tubes each. The electromechanical steering varies boost depending on vehicle speed, combining highly precise tracking with low sensitivity to disruptive road surfaces. The overall ratio is a sporty and direct 15.9:1. An optional sport suspension lowers the body by 0.39 inches. Standard wheels are 18- inches in a 7-spoke design with several optional 19- and 20-inch wheels available.